How To Avoid Overwhelm By Only Allowing 10 Tasks per Day. Recently, I’ve noticed a lot of people, in the forums I follow, commenting on how overwhelmed they feel and how many tasks they have on their to-do list every day. I’ve seen numbers ranging from twenty to sixty tasks per day and I know, from my own experience, that these numbers are not sustainable and what will happen is people will end up rescheduling many of these tasks because they won’t get done. The problem with a long list of to-dos is the very sight of such a list leads to that feeling of overwhelm. Looking at a list of thirty to-dos first thing in the morning is just going to put you off wanting to even start attacking such a list. Instead what you need is a list of around ten items that will leave you feeling inspired to get started. We live in a world of distraction. No matter who you are or what you do, you are going to get distracted. Email brings new tasks, bosses and colleagues ask us to do little pieces of work for them and clients and customers demand attention. These are unavoidable. When you start the day with a list of thirty tasks something is going to break, and usually that something is your task management. When you assign yourself a maximum of ten tasks a day on your to-do list two things happen. The first is you have time to deal with the distractions that will come in and second you will be forced to prioritise what you want to get done that day which helps you to focus on the things that are meaningful to you. The ten task maximum does not include your regular daily routines. If you have a morning routine of exercise, planning and learning for example, then the morning routine would not be included in your ten tasks. A morning routine is just something you do every morning and if you do it regularly — ie every morning — you should not need any reminder on your to-do list to do it. I have a morning routine that involves 45 minutes of studying and 15 minutes of meditation. These two tasks are not on my to-do list, but the one hour is scheduled on my calendar as my self-development hour. It is a non-negotiable part of my day. I have been following this routine for nearly a year now and I really do not need to be reminded to do it in my to-do list. All I need to see is at 5 AM tomorrow morning I will do my studying followed by fifteen minutes of meditation. I also have around eight routines admin tasks that need doing at the end of every day. Little things like writing up student feedback, updating attendance records and tracking new students in my learning centre. These routine tasks are on my to-do list, but I filter them out and they only show up at the end of the day when I need to see them. For the majority of the day, I do not need to see these tasks because they cannot be done until the end of the day and they act as little reminders to make sure I have done them. I do not include them on my list of ten tasks. What I want to do is see ten tasks (or less if possible) when I begin the day and those ten tasks are meaningful and advance my work or projects in a positive way. I have a daily calendar event on my calendar for doing admin tasks (8:00 pm to 8:50 pm) and so I know they will get done. Because it is inevitable we will be distracted by something each day, be that a request from a customer or a demand from a boss, blocking an hour or two off each workday to get on with the ten tasks you have assigned yourself is crucial. All of us should be able to find an hour in the morning and an hour in the afternoon for undisturbed focus work. There really isn’t anything so urgent it cannot wait an hour or so. Of course, if you work in the emergency room of a hospital or are a firefighter, then you are not going to be able to do this, but any information worker who cannot block off an hour or so each day has bigger problems than just a long list of to-dos. In twenty-five years of working in the legal and education professions, I have never once come across a situation where I was not able to block one hour off to get some focused work done. I have some language students who sometimes tell me they are too busy to do their English class, yet they are always able to find ninety minutes for their lunch (officially they have one hour, but they go for lunch at 11:30 am and they don’t return to their desks until close to 1 pm.) When we need to, we can find the time. It’s just a question of priorities. And that nicely leads me to the biggest benefit of only allowing ten tasks on your to-do list each day. It forces you to prioritise. We all have a lot of things we would like to do each day, but we only have twenty-four hours to do them. We cannot do everything at once. When you are limited to just ten meaningful tasks each day you are forced to think about which of the tasks you have to do will have the biggest positive impact on your day and your active projects. When you choose tasks that will move your projects forward each day you are making a bigger impact on your projects than if you were randomly picking away at a long list of tasks. You become more focused on the outcomes and less focused on the trivialities. Ultimately, projects need to be completed and focusing on the tasks that will get you to completion rather than the little insignificant tasks will get you to the outcome you want faster. 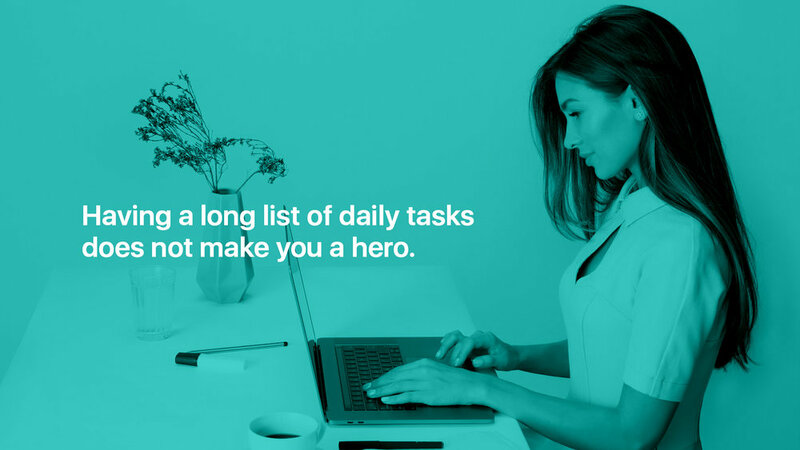 Having a long list of daily to-dos does not make you a hero. All it does is cause you to feel overwhelmed and that leads to procrastination. Reducing your to-do list to the ten most important tasks each day allows you to begin the day focused and energised and ready to move your projects towards the outcomes you desire faster. You will procrastinate less and you will still have time each day to deal with the unforeseen interruptions and distractions that are an inevitable part of living in the twenty-first century.